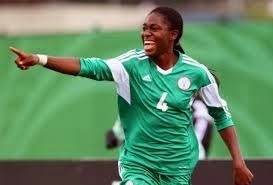 Nigerian striker, Asisat Oshoala, has made history by winning the BBC’s maiden Women’s Footballer of the Year award. The reigning African Women’s Footballer of the Year saw off the challenge from other contenders which included Spain’s Veronica Boquete, Germany’s Nadine Kessler and Scotland’s Kim Little and Brazilian forward, Marta, to win the top prize. The 20-year-old is already in Canada where she will be representing Nigeria at the FIFA Women’s World Cup. Oshoala was also with Nigeria at the under-20 World Cup in Canada last summer, winning the golden boot for the tournament’s top scorer before going on to win the MVP at he Africa Women’s Championships in Namibia. Interestingly, another Nigerian, Super Eagles’ captain, Vincent Enyeama, was in the run to win the male version of the BBC award but he lost out to Algerian Yahcin Barhimi.